Washington, DC —Individuals legally allowed to carry concealed handguns are responsible for at least 28 mass shootings since May 2007, resulting in the deaths of 131 victims, according to updated data released by the Violence Policy Center (VPC). Details can be found in the latest update to Concealed Carry Killers, an online resource that offers examples of non-self defense killings by private citizens legally allowed to carry concealed handguns in public. Overall, Concealed Carry Killers documents 481 incidents in 36 states and the District of Columbia since May 2007, resulting in the deaths of 644 people. In the vast majority of the 481 incidents documented (402, or 84 percent), the concealed carry killer either committed suicide (189), has already been convicted (159), perpetrated a murder-suicide (40), or was killed in the incident (14). Of the 63 cases still pending, the vast majority (53) of concealed carry killers have been charged with criminal homicide. Four were deemed incompetent to stand trial, and six incidents are still under investigation. An additional 16 incidents were fatal unintentional shootings involving the gun of the concealed handgun permit holder. Twenty-eight of the incidents were mass shootings (3 or more victims), resulting in 131 deaths. Recent mass shootings perpetrated by concealed carry killers include the Navy Yard shooting in Washington, DC in September 2013 that left 12 innocent people dead. In July 2013, a concealed handgun permit holder left six innocent people dead at an apartment complex in Hialeah, Florida. The database also shows at least 14 law enforcement officers died at the hands of concealed carry killers since May 2007. The 481 incidents do not include any that were ruled as self-defense. 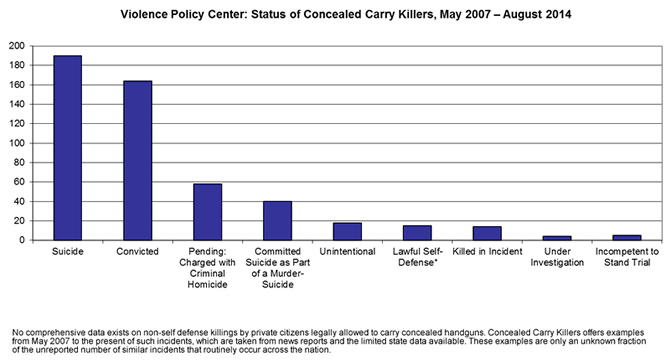 Only 15 of the hundreds of examples tallied in Concealed Carry Killers were eventually deemed lawful self-defense. Such cases are then removed from the site’s ongoing totals.